Interruption. – Life Is Such A Sweet Insanity. One of the “runaway conditions” of trends in the latest technology is how we as users are so willing to allow ourselves to be interrupted with regularity, even expectation. Last week I was in an all-day video conference at work. There were eight participants and we are scattered all over the country. Part of the meeting included the a project leader sharing their screen for all to see, mainly so we could review various subjects via a Powerpoint presentation. I couldn’t help but notice the person sharing their screen had a notification pop up on their screen every time they received an email, and honestly, they receive a lot of email. Personally, I could never get any work under those conditions. As a viewer and passive participant in the moment, I found the popups maddening. I couldn’t imagine working on a laptop configured that way. Many folks in business live and die by their email. I’ve met my share of users that manage their business (and probably personal) lives via Inbox. They store everything in the Inbox and it’s usually overflowing with thousands of messages. They live in a reactionary paradigm, awaiting the next email to take action. This got me to thinking about notifications in general. There’s quite a few people at work that think nothing of seeing “In A Meeting” or “Giving A Presentation” on my work Skype status and sending me a message that says, “I see you’re in a meeting, please ping me when you’re done”. When I’m leading a meeting you can usually tell this is happened because I start stumbling and losing my train of thought for a few moments and then I have to stammer a couple of times before resuming my train of thought. I have been in countless meetings where this has happened, and not only when I’m doing the presenting or speaking. We allow ourselves to be interrupted and we have software that encourages us to be interrupted. With Microsoft’s Skype for Business (our main chat platform at work), I’m either “Available”, “Busy”, or on “Do Not Disturb”. I can still be reached by Skype message with the first two settings, the second setting halts messages getting to me completely. If I were to take this whole “I know you’re busy but please ping me when you’re done” thought process to the real world, it’d be like walking into a conference room with a bunch of suits around a conference table, donuts in the corner, and a presentation in process, and someone busting through the front door to say, “I know there’s a meeting in progress, but J.P. please come see me when you have a moment”. We’d never dream of doing that in real life, why would we do this in the electronic world? We’ve had answering machines for decades, why haven’t we built an “answering machines” mechanism into our chat programs? Imagine a Skype setting where we could indicate “Please leave a message”. The user could then send us an IM as normal but it would be held in a queue until I either changed my status to something a bit more receptive or I decided to close Skype, in which I would get a notification that I had messages waiting in queue. Some may counter, “well, that’s why we have email”, and this is perfectly valid point. However, as we move from overflowing email mailboxes to “instant messaging”, folks have an expectation to use Instant Messaging and to get a response instantly. Sometimes I like to let them simmer. 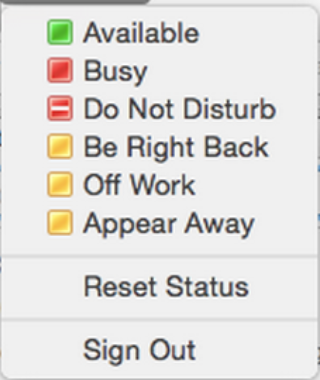 This trend of active interruption isn’t limited to Skype or work. All of the social media platforms have built apps that will notify you as often and as quickly as possible. “Here’s a tweet you missed”! “Your friend has updated his Facebook status”! “Two people liked your Instagram photo”! This is why any social media apps on my phone have all notifications turned off (and I have significantly reduced the number of social media apps on my phone to begin with). No little red highlighted number next to the icon, no popups, no toaster messages, nothing. I never know when someone waves at me without actually taking a few moments, on my own time, on my own turf, and logging into the site to see what’s happened since I did the same on my own time and own turf. I own the way I am contacted, I don’t let others call the shots. This has done much to restore my sanity. I’m currently working on a personal growth project this weekend cleaning the cruft out of all my social media avenues. How many folks do I follow on Instagram that post nothing but selfies? Do I really want to be “friends” on Facebook with someone that was recommended through an algorithm? Do I really know anything about them? On how many social networks do I need to follow this inspirational speaker? How many groups do I need to belong to? It’s all about focus. Technology should not dilute our focus. It should help us focus. I’m still all for connecting with others but we should all do it on our own terms, not as dictated by corporations that are monetizing our data and trying to get us to engage with their platform as often as possible. We need to take control of our technological use habits. And we don’t need a notification to tell us to make it happen.